To launch ?something?, it also need ?something? to attract people attentions, and without exception for paint products. So we start to think, how can make a paint product can be so close to people daily life, how is the connection? As a first step, we try to find out what is the most people touching thing to reach their emotion, and get their attention. And for the next step, we try to combine it to get closeness between these ?touching thing? and DULUX paint products. Finally, after we had the conclusion, Next Digital Indonesia team together with DULUX decided to choose ?Father ? as the closest figure for everyone in order to approach their emotion, and put it into DULUX weathershield campaign. By taking father day?s moment, we start to create DULUX digital campaign called ?Ayahku hebat? . 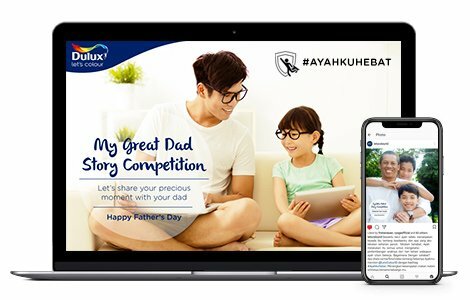 During this campaign, we try to personalize DULUX Weathershield like a father figure which is always protecting in any condition just like DULUX purpose, and engage people to share stories with their fathers by including hashtag #ayahkuhebat. Aware about current video trend in any social media content, we also create the emotional video ads about father and her daughter to spread Dulux weathershield products awareness. and of course, to provoke more people to participate in our digital campaign. As a awareness booster, we use Google Display Network during the campaign.